The Scherzer International offices were bright red on Friday, February 2 to show support in the fight against cardiovascular disease. 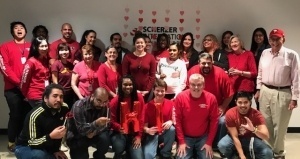 Employees at SI joined the National Wear Red Day movement to raise awareness about living healthier. 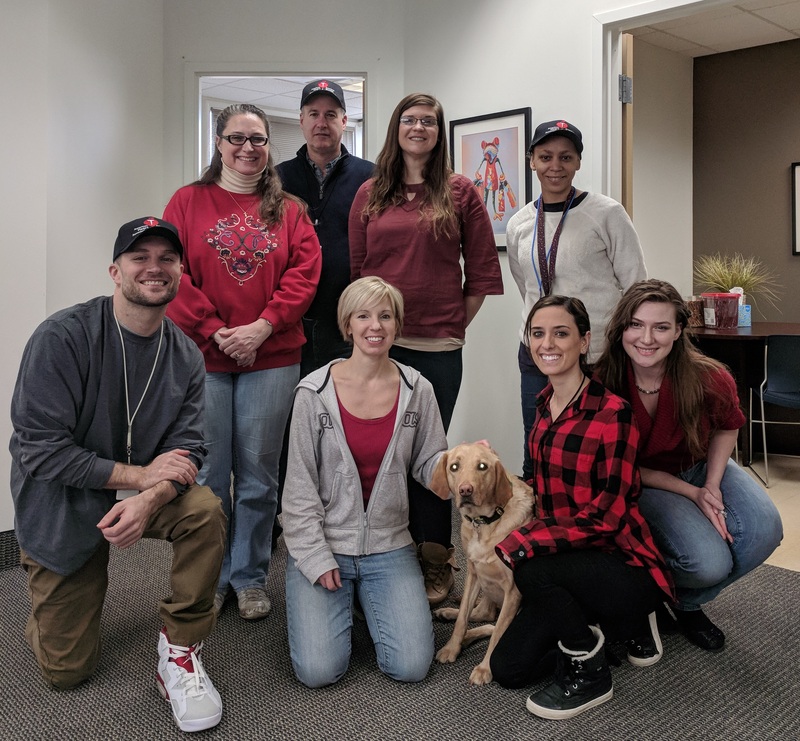 The pictures above show Daisy (SI’s mascot) and employees from both the Woodland Hills and Rocky River offices wearing red as a visual reminder to us all to continue the fight against heart disease. The Federal Financial Institutions Examination Council (FFIEC) released on December 11, 2013 final guidance on the applicability of consumer protection and compliance laws, regulations, and policies to activities conducted via social media by banks, savings associations, and credit unions, as well as nonbank entities supervised by the Consumer Financial Protection Bureau. The guidance provides considerations that financial institutions may find useful in performing risk assessments and developing and evaluating policies and procedures regarding social media. Last month, the SEC issued a report that makes it clear that companies can use social media outlets such as Facebook and Twitter to announce key information in compliance with Regulation Fair Disclosure (“Regulation FD”) as long as investors have been alerted about which social media will be used to disseminate the information. divulge any personal social media, except as provided in subdivision. The law also prohibits an employer from discharging, disciplining, or otherwise retaliating against an employee or applicant for not complying with a request or demand by the employer that violates these provisions. However, an employer is not prohibited from terminating or taking an adverse action against an employee or applicant if otherwise permitted by law. The law does preserve an employer’s rights and obligations to request that an employee divulge personal social media information reasonably believed to be relevant to an investigation of allegation(s) of employee misconduct or violation of applicable laws and regulations, provided that the information is used solely for purposes of that investigation or a related proceeding. An employer is also not precluded from requiring or requesting that an employee disclose a username or password for the purpose of accessing an employer-issued electronic device. A companion law, AB 1349 that establishes similar requirements for postsecondary education institutions in regard to their students also goes into effect on January 1, 2013. The SEC’s order instituting administrative proceedings against Fields charges that he made multiple fraudulent offers through his two sole proprietorships – Anthony Fields & Associates (AFA) and Platinum Securities Brokers. Fields allegedly provided false and misleading information concerning AFA’s assets under management, clients, and operational history to the public through its website and in SEC filings. Fields also failed to maintain required books and records, did not implement adequate compliance policies and procedures, and promoted himself as a broker-dealer while he was not registered with the SEC. Also today, in recognition that fraudsters are now turning to new and evolving platforms to peddle their scams, the SEC issued two alerts to highlight the risks investors and advisory firms face when using social media. One of these alerts, a National Examination Risk Alert titled “Investment Adviser Use of Social Media,” provides staff observations based on reviews of investment advisers of varying sizes and strategies that use social media. The bulletin addresses issues that may arise from social media usage by firms and their associated persons, and offers suggestions for managing the antifraud, compliance, and recordkeeping provisions of the federal securities laws. The alert notes that firms need to consider how to implement new compliance programs or revisit their existing ones to align with the rapidly changing technology. In the SEC’s second bulletin, an Investor Alert titled “Social Media and Investing: Avoiding Fraud” prepared by the Office of Investor Education and Advocacy, the aim is to help investors be aware of fraudulent investment schemes that use social media, and provide tips for checking the backgrounds of advisers and brokers. Legal experts say that litigation resulting from employer misuse of social media information is likely to rise, at least until more case law is established. And even if the company prevails in such lawsuits, there may be reputational risks as the cases grab national spotlight. showed her drinking alcohol during a European vacation. Myspace page meant for employees but not managers. The jury found that the employer violated the federal Stored Communications Act and the equivalent New Jersey law, and awarded the employees $3,403 in back pay and $13,600 in punitive damages. Hillstone appealed before the parties reached an undisclosed settlement. to discrimination, harassment, unpaid overtime and other wage violations, or any activities that may trigger an employee’s whistleblower protection.